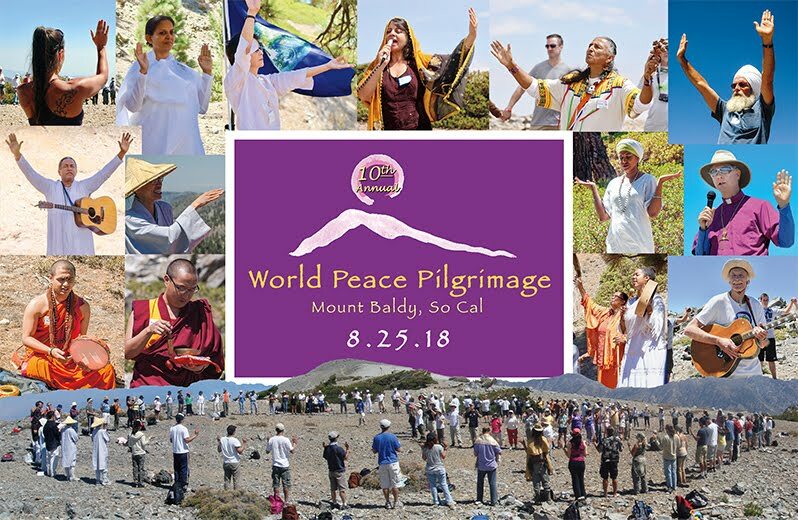 Since 2009 hundreds of people from many different faiths have come together annually on sacred Mount Baldy in the San Gabriel Mountains, east of Los Angeles, to send out waves of love and light to the world. This inspiring and joyous event draws together local spiritual communities to walk together, sing together, and pray together in the heart of nature - for World Peace. In these days of great turmoil in our communities and in the world, it is even more crucial that all faiths come together to cooperate in Spiritual action for World Peace. United, the Spiritual workers for Peace are a force to be reckoned with! The World Peace Pilgrimage is open to people of all faiths, denominations and ages. It is a non-profit, non-commercial and non-political event. We climb the mountain as one human family. This is a FREE EVENT other than the cost of the Mt. Baldy Resort lift ticket ($15 round-trip if you book online; $25 at the window) and parking ($5). The World Peace Pilgrimage is a non-profit event organized by the non-profit organization, The Aetherius Society, registered 501(c)3. All our costs for supplies and equipment are either donated directly or made possible through donations. Donations can be made online via PayPal by clicking on the link below. To make a donation over the phone, or by mail, contact us.